“Charles Parmelee Rising, aged 61, died in New York City at 5pm Saturday from apoplexy, having moved there three years ago. 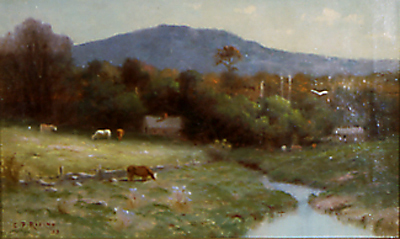 He wa born in Auburn and at an early age took to painting. He studied under George Clough. 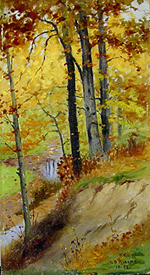 His works were for the most part nature scenes of the Finger Lakes done in both water and oil. In later life he did charcoals. As his reputation became known the US Printing and Engraving Company reproduced many of his water colors and Dietrich the oils. The Christian Herald featured one of his works on a cover and later accepted over twenty more. At the time of his death he was about to embark on a large amount of works for the New York City area. He left about 200 previously done paintings unsold when he died and it is hoped they will be returned to Auburn for distribution.